While the northwestern part of the state was stocking up on bottled water, canned goods, batteries, and gasoline, we South Floridians considered ourselves lucky – we dodged the hurricane bullet. It’s only a matter of time until another storm blows our way but until then, we celebrated the sunshine of Labor Day Weekend. And FYI, I’m still wearing white after this. Kicking off Labor Day Weekend at Tiki 52. Peeking out from the real tiki bar. Old school Jupiter decor – love the coconut heads hanging off the moose antlers. Oh, you know, just relaxing in this giant chair outside the patio store. I think we need one of these. It can fit all of our friends. On Saturday, the whole family trekked out to the Labor Day Weekend Bull Bash in Okeechobee. Fun Florida Fact: Did you know that Florida is the largest cattle producing state east of the Mississippi River? There is nothing in the world quite like a rodeo. As Garth Brooks once said, “It’s bulls and blood, it’s dust and mud, it’s the roar of a Sunday crowd.” And I just adore Garth Brooks. To be honest, we saw more buck-offs than rides. But P was happy because he finally got some Cajun boiled peanuts… Once a Georgia boy, always a Georgia boy. Will it be an eight second ride? Nope, doesn’t look like it. We stopped to look at Lake Okeechobee on the way back home. It’s the largest freshwater lake completely within a single one of the lower 48 states. P said that it’s like the ocean – so big that you can’t see the other side. P and I spent Sunday afternoon at the beach with friends at Loggerhead Park. I haven’t seen the water this beautiful in a while. It was extra salty and the perfect blue-green. We live where the rest of the country vacations. Our view north toward the Juno Beach pier. 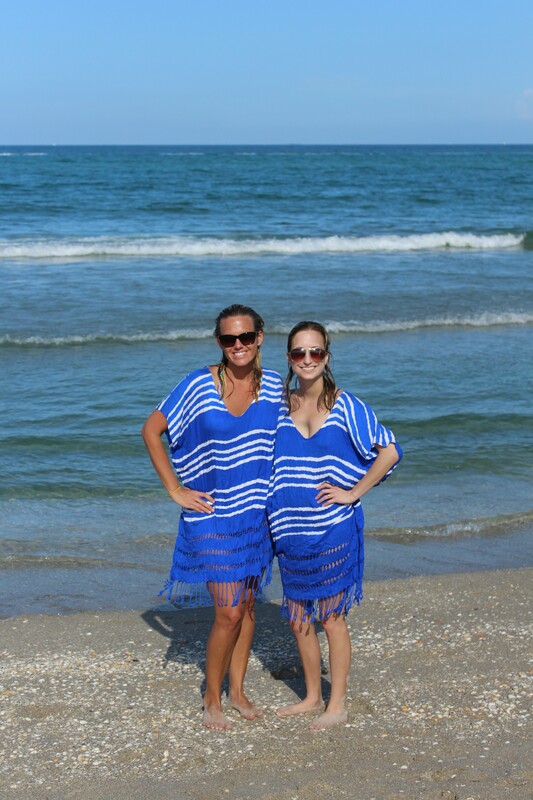 Leah and me, in our matching Seafolly kaftans from Bunulu – thanks, Bunulu! P.S. Her tan puts me to shame. Monday was gloomy so we stayed home and P practiced his pimento cheese making skills. Pimento cheese is not the most appetizing looking thing in the world. And, of course, P made his extra spicy with a couple (okay, much more than a couple) dashes of Tabasco sauce. We doctored up this recipe and then I practiced my food photography skills. This involved a lot of maneuvering of pimento cheese in a bowl and P’s iPhone flashlight prowess. Here was the final product. As I said, my food photography is a work in progress. Perhaps pimento cheese doesn’t make the best subject. I hope you all enjoyed your Labor Day Weekend and that you headed back to work refreshed and ready to go! Yes, P will definitely bring you some pimento cheese!! I know, isn’t he just darling?